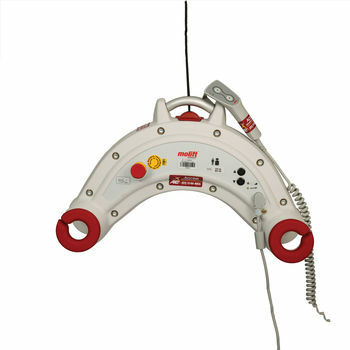 The Nomad is a flexible and userfriendly ceiling hoist. It is intuitive and easy to operate. Curved shape designed to provide more head space for user. Integrated 4-point yoke for ultimate safety and comfort. Nomad weighs just 6.8 kg, and has a remarkable SWL of 230 kg. Ideally suited for institutional applications. Intuitive hand control makes the Nomad quick and easy to operate. The hoist is charged via the hand control. Largest battery capacity in a portable hoist on today’s market. Visual and audible battery charge and service notification to maintain optimum performance. Emergency lowering and emergency stop functions. Soft stop-start function for user comfort. High lift speed of 35 mm/second with soft start-stop function. Exceptionally high battery performance (up to 70+ lifts per charge. Compatible with patented Flexi-Link connection system.